8 Commercial Real Estate and Properties in Hunter Valley are listed in 9 categories. We have 130 Industrial Warehouses for Sale & Lease , 92 Retail Shops for Sale & Lease , 87 Offices for Sale & Lease , 38 Development Lands for Sale & Lease , 22 Showrooms for Sale & Lease and 13 Medical and Consulting Properties for Sale & Lease . 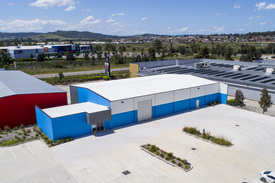 Located just off the New England Highway only 10 minutes north of Maitland's CBD, this major warehouse facility is now available Property Features • Secure steel frame concrete panel construction. • Large on site carpark for staff and customers. • Semi trailer access for deliveries. • Ideal warehouse or trade outlet. • Roller door access. • Zoned B5 Business • Ideal for numerous uses Building areas • Office Area: 138sqm • Workshop Area: 828sqm • Total Building Area: 966sqm • Site Area: 3,000sqm Contact our team today for further information. 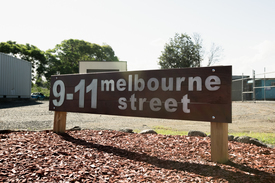 Approximate Subject to council approval . . If you dream of producing your own organic food and free range eggs then this could be the property for you. Only 30 minutes off the M1 Motorway, Euneka is the perfect place to escape the city, an inspiring place to tap into your creativity, a wholesome place to raise a family and a paradise to retire to. Welcome to "EUNEKA" 100 acres in the secluded Murrays Run Valley, between Yarramalong Valley, Kulnura and Laguna. Centrally located in the middle of everywhere, Euneka is approximately 1 hour form the outskirts of Sydney, Newcastle and Cessnock, and only 45 minutes from Gosford CBD. The Property Main house and separate luxurious guest studio. Multiple sheds, with undercover parking for 10 cars. Numerous covered orchards, a vegetable garden, herb garden, glasshouse and underground storage bunker. Professionally landscaped gardens, showcasing fully established trees and hedges. Fully fenced 2.5 acre area, with 10 years of organic soil development. Custom built chicken coop and covered run. Secluded valley paddock; a favourite for camping. Two dams, a spring fed creek and 172,000 litres in storage tanks. Main House High on the plateau, the house captures the views and north east sea breeze. Large eat in farm kitchen with walk in pantry and European appliances. Multiple living areas and plenty of storage space. Four bedrooms; two with WIRs and two with BIWs. Main bathroom and master bedroom ensuite. Wood fired combustion heating with inline ducting. Guest Studio Self contained with kitchenette and ensuite. Reverse cycle air conditioning and combustion wood heater. Large covered timber deck for BBQs and entertaining. Private covered courtyard with unique shower. Additional Features Professionally landscape outdoor baths and shower, with viewing platform. Telecommunications are Optus mobile, NBN broadband and Telstra landline phone. Utilities are main powered electricity, grid connected 10kW solar system, LPG and solar hot water. Endless supply of wood for heating. E & OE. Please note that all information herein is gathered from sources we believe to be reliable, however Capital One Real Estate cannot guarantee its accuracy and interested parties should rely on their own enquiries. All images are indicative of the property only. Opportunity to lease this soon to be constructed modern warehouse and office located within the Anambah business park. Features Include • Office area: 84m2 • Warehouse area: 504 • Land area: 2031 • Eve Height 6m • Onsite parking • Modern design • Rear yard • 2 roller doors Contact the agent to register your interest!! Wow, here we have almost 37 acres (14.8 Ha) of mostly clear, near level, lush green land just a few minutes from amenities available right now. A large shed sits towards the front of the property with a neat one room flat attached, along with an open two bay machinery shed and round yard. The property is divided into vast open paddocks with three dams, some small stands of shade trees and is fully fenced. Here is a great opportunity to create something special from this fantastic blank canvas. Disclaimer: Every precaution has been taken to establish accuracy of the above information but does not constitute any representation by the owner or agent. Information is gathered from sources we believe to be reliable; we cannot guarantee its accuracy and interested persons should rely on their own enquiries. Factory warehousing secure concrete block construction. 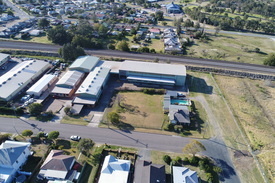 Flexible floor area up to 2,000m² Flexible land area up to 4 hectares Major fitout includes: Offices, extensive ducted and compressed air systems, cool rooms, lunch rooms, change rooms, incubator rooms, wash rooms, 3 phase power, lighting galore Additional brick caretakers residence optional Adjoins Morisset Tennis Centre Minutes to Town Centre, Railway Station, Expressway Interchange Lake Macquarie Disclaimer: Every precaution has been taken to establish accuracy of the above information but does not constitute any representation by the owner or agent. Information is gathered from sources we believe to be reliable; we cannot guarantee its accuracy and interested persons should rely on their own enquires.